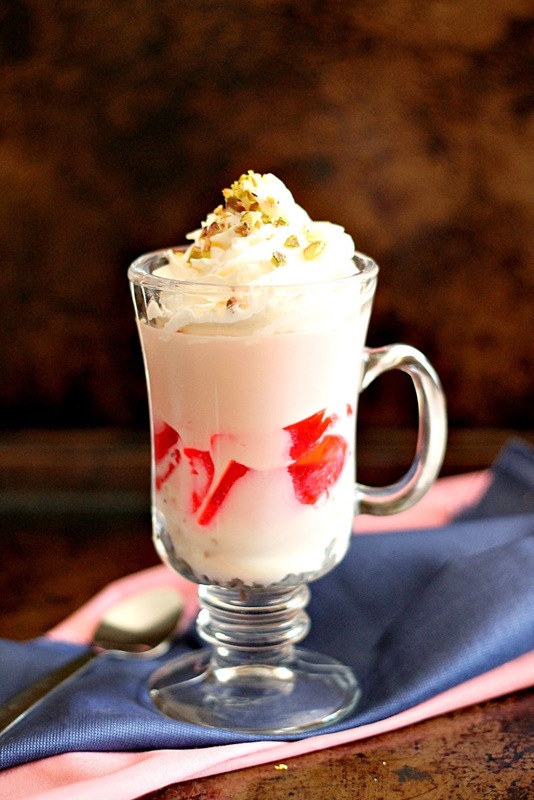 Today I am sharing a recipe which is made extra decadent with Gay Lea Whipped Cream. Falooda is an Indian/Pakistani chilled dessert beverage. It is one of my husband's favourite desserts although it had always been something I had avoided because of the black seeds at the bottom. I was a very picky eater growing up and I couldn't get past those black seeds. I had never even tried Falooda before I got married. One year I decided I would give a try at making Falooda for my husband since he enjoyed it so much. It turned out very well! The seeds are the bottom are tukmalanga or basil seeds. They are similar to chia seeds. When they are soaked they expand and become jelly-like. They can easily be found at an Indian grocery store. The dominant flavour in Falooda is from Rooh Afza which is a sweet rose syrup that can also be found in Indian grocery stores. When making my Falooda, I topped it with Gay Lea Whipped Cream to make it extra decadent. 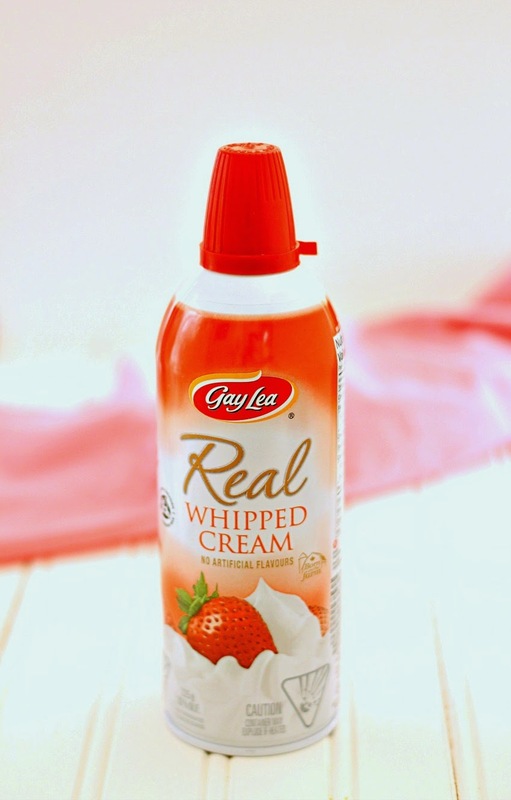 Gay Lea Whipped Cream is made with real cream and is nut free. It is also Halal and Kosher certified! Falooda has several components. At the bottom are the tukmalanga seeds topped with Vermicilli Kheer, Jello, ice cream and some Rooh Afza flavoured milk is poured on top. I don't think the Jello is a traditional ingredient in Falooda but I loved the addition of it. Finally I have topped my Falooda with Gay Lea Whipped Cream and some chopped pistachios. Before eating, give it a stir to mix up all the layers. For more recipes using Gay Lea Whipped Cream please head over to Gay Lea's website! First make the Vermicilli Kheer. In a medium saucepan, add the falooda sev and roast on med-low heat until golden. Add 2 cups of milk and increase the heat to medium. Cook until the noodles are soft. Add the sugar and cook until the kheer has thickened slightly. Cool. The kheer will thicken more as it cools. Next make the Rose Milk. Mix together the milk, Rooh-Afza and sugar. Chill in the fridge. Soak the tukmalanga in 1 cup of water for 10 minutes. Drain and chill. To assemble the falooda, add 2 tsp of tukmalanga to the bottom of a tall glass. Add some vermicilli kheer, a few spoonfuls of Jello and a scoop of ice cream. Pour some Rose Milk on top. Top with Gay Lea Whipped Cream and sprinkle pistachios on top. Enjoy! i may or may not have a little addiction with falooda..this is making me drooool. it was kind of hot here today,i could surely use some of your delicious falooda!! Falloff is one desi dessert that I have never tried but I have wanted to for a while now. The thing that scares me however is the rooh afza ! However I do think I will just have to try making it at least once!